In a sentence or so: Alanna and Thom are twins but Alanna wants to be the knight and Thom wants to be the sorcerer so they switch places and Alanna pretends to be a boy. Much badassery ensues. Alanna’s always been into the whole sword fighting and chivalry scene and not so much the sorcery and ladylike things. 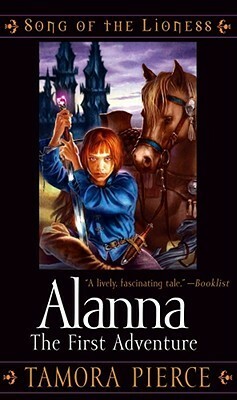 Her twin Thom happily takes the sorcery path, which he can do as a boy, and Alanna takes his place at the castle training as a knight, in which she must pretend to be a boy. Despite being quite gifted at sorcery, Alanna loves life at the castle and quickly makes friends and focuses on her training while keeping her gender under wraps (at some points, quite literally). Since this is the first book in a series, we’re really getting to know the characters and the plot is slowly being laid out for us. Alanna quickly befriends the popular kids, including heir to the throne Jonathan, when she gives a bully the business. She isn’t too proud to get involved with The Thief King, George, because he’s an alright guy and who is she to judge anyone? She’s a girl in disguise so she’s pretty accepting with everyone’s life paths which only makes her more endearing to the other characters and to us as the reader. There’s a shady sorcerer who is totally shady and does weird things she can’t prove, but obviously we all know something’s up. Alanna spends a good deal of the novel growing up, proving herself, scoring a sweet magical sword, and proving her loyalty to her kingdom while keeping an eye on said shady sorcerer. I had heard the praises of Tamora Pierce sung from the rooftops from the likes of Tara, Heidi, Alexa, and more. They were right to do so! Pierce creates a great mythology in Tortall in Alanna: The First Adventure that I know we’ll come back to in the rest of the series. Her character development matches the pace of the novel perfectly. I’m never left wanting more of one or the other. It’s just perfection for this little nerdish heart. If you’ve been waiting to start this series, don’t. If you’ve never read fantasy before, start here. If you’ve read this series before, reread it. Can I make myself any more clear? I LOVE ALANNA. Fave quote: "George looked at her for a long moment. Finally he replied, 'And why do you find it so hard to think someone might like you and want to do things for you? That's the way of friendship, lad.' Alanna shook her head. 'But I haven't done anything for you.' 'That's not how it works,' the thief said dryly. This was confusing, and Alanna said so. George laughed and took them to lunch." Pairs well with: ALL THE BEST epic fantasy! Fix er up: I didn’t realize we started so young with Alanna, but honestly she does age fast so just wait for it if it all feels a little too middle grade for you. She grows up so fast! Hello, I hope your day is going great! 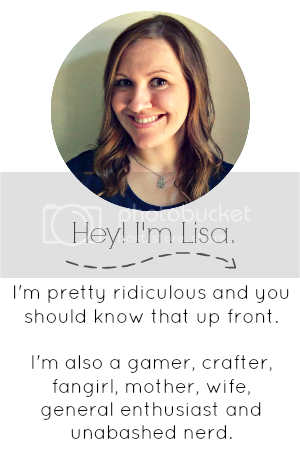 Just wanted to let you know I’ve nominated your blog for the Liebster Award. I have heard amazing things about this series and Tamora Pierce in general. I actually live in the city that Pierce lives in now, so I feel super bad for never reading any of her books. Maybe I should start here! I recently read and loved this one too so YAY! I wasn't expecting it to be as amazing and I severely regret reading it so late! I am so grateful to my friend Mandy who introduced me to Pierce (she also introduced me to Terry Pratchett-she's amazing obvs!) Hope you enjoy the rest of the series just as much! FINALLY! Ha ha, I thought you had already read Alanna. Granted, I am one to talk as I have only read the first book. But totally awesome right? I am so incredibly happy that you loved this book! I'm a big fan of Tamora Pierce, and I think everything she's written (with the exception of the Beka Cooper series, which I need to get on reading) is BRILLIANT. Her characters and her world are just so amazing! I would LOVE to meet Tamora one day!